Everyone knows that nothing cleans up a mess like Bounty Paper Towels. But did you know that there are some messes that are even to big for Bounty? Well, not anymore! Introducing Bounty Brand Biscuits! Nothing sops up grease and filth like a tasty country biscuit. Our team of Bounty Chefs have created the soppiest biscuit ever invented. This cleaning biscuit can do it all! Filthy Kitchen? - Sopped it up with a biscuit. Spilled Motor Oil? - Sopped it up with a biscuit. Clogged Toilet? - Sopped it up with a biscuit. Blood Stains? - Sopped it up with a biscuit. Diarrhea Diaper? - Sopped it up with a biscuit. Country Gravy? - Bounty Brand Biscuits are not for human consumption. 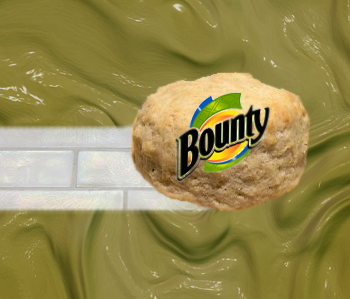 Sop up a tube of Bounty Brand Biscuits today!